ISRA began its YI Program at the 2008 meeting in Budapest to encourage and assist young scholars who are getting started or are in the early stages of their aggression research career. ISRA encourages graduate students, postdoctoral fellows, and junior faculty within 3 years of their graduate degree to apply for the program. Application instructions are posted in advance of the World Meeting, usually in the late Fall. The Pre-meeting workshop focuses on supportive group discussion to help YIs plan and write grant applications and manuscripts and/or revise them in accord with reviewer criticisms. YIs are encouraged to submit proposals and papers on which they are working. Discussion can range from specific editing suggestions to broad research questions. Scientific publication strategies, experimental methodologies, and more general aspects of career development in aggression research will all be addressed as they come up. YIs meet with a different panel of mentors during lunch or dinner each day for informal discussion. Mentors may include plenary speakers who are available for follow-up questions about their presentations. YIs meet with members of ISRA. They will also get acquainted with other young investigators of their generation. Mutual support and fruitful collaborations have developed out of past YI interactions. Participants in the YI Program have found it to be an enjoyable and enriching experience. Joanne Beames received her Bachelor of Psychology (Hons) from the University of New South Wales, Sydney, in 2015 and is currently in her 4th year of the combined Ph.D./Clinical Psychology Master’s program at the same university. Her Ph.D. research focuses on the self-control training (SCT) effect in the context of anger and aggression. Her research investigates whether the training effect is robust, how long the effect endures, whether the amount of training is proportional to the benefits accrued, and the underlying neural, genetic, and psychological mechanisms. She is also involved in multidisciplinary projects that apply SCT principles to real-world populations with anger/aggression problems (e.g., impulsive-violent offenders, youth at risk in the community). In the future, she would like to extend her research to investigate self-control in other clinical populations and look toward treatment evaluations. Massil Benbouriche received his M.Sc. in clinical psychology as well as his Ph.D. in experimental social psychology from Rennes 2 University (France), and his Ph.D. in criminology from the University of Montreal. He is currently a Postdoctoral Research Fellow in psychology and biobehavioral health at Wayne State University. His doctoral research examined the effects of alcohol and sexual arousal on men’s sexual coercion. His postdoctoral research focuses on the role of executive functioning and self-regulation processes in sexual violence. He is also developing a broader research program about self-regulation in maladaptive behaviors. Ashlee Curtis received her Bachelor of Psychology (Hons) and her Ph.D. from Deakin University. She is currently a Research Fellow in the School of Psychology at Deakin University. She has a strong research interest in determining how responsivity to treatment for violent and aggressive persons, particularly those with other complex comorbidities, such as a history of trauma, mental health concerns, and substance use problems, can be improved. She is interested in understanding the key areas of the brain implicated in both aggressive and violent behavior, where a history of trauma, mental health, and substance abuse is present, and how this might be implicated in responsivity to existing interventions for aggressive and violent behavior, and in turn their resulting effectiveness. Gabriela Gan received her diploma (equivalent to MSc) in psychology from Heinrich-Heine Universität Düsseldorf and her doctoral degree in psychology from Technische Universität Dresden in Germany. She was a postdoctoral fellow at the Icahn School of Medicine at Mount Sinai in New York and is currently a postdoctoral fellow at the Central Institute of Mental Health in Mannheim and a fellow of the Olympia Morata program of the University of Heidelberg. Gabriela’s research focuses on behavioral and neural mechanisms underlying poor self-control, specifically under the influence of alcohol or when being provoked. Currently, her research is shifting toward better understanding the interplay between neural, genetic, and environmental contributors of aggressive behavior. To this end, she combines functional magnetic resonance imaging with psychological paradigms, genotyping, and ecological momentary assessment. Alexis Garcia received her B.A. and M.S. at Florida International University (FIU). Alexis is currently a 4th-year doctoral student in the Clinical Science Program in Child and Adolescent Psychology at FIU. Her line of research focuses on developing evidence-based interventions for children with externalizing behavior disorders. More specifically, through the use of multimodal assessments (i.e., biomarkers, behavioral observations, self-reports), her work aims to better understand how emotion dysregulation may be associated with poorer outcomes following treatment. Gadi Gilam is a postdoctoral research fellow at the Systems Neuroscience and Pain Laboratory at Stanford University School of Medicine. He received his B.Sc., M.A., and Ph.D. from Tel Aviv University. Gadi combines basic and translational research from a social cognitive and affective neuroscience perspective, integrating psychological theory with biological constraints, and emphasizing research design, experimental methods, and multi-level and multi-modal measurements. His Ph.D. thesis focused on human anger, the neural mechanisms mediating its experience and expression, and their link to psychopathology, namely in post-traumatic stress disorder (PTSD). While currently making a transition in to the field of acute and chronic pain, Gadi continues to do research on anger and aggression, situated within socially interactive laboratory settings. Elizabeth “Beth” Green received her A.A.S. in police science from Oklahoma State University-OKC in 2001, her B.A. in liberal studies with a concentration in behavioral studies from Oklahoma City University in 2005, and her Master of Criminal Justice from Oklahoma City University in 2007. She is currently a sociology Ph.D. student at the University of Oklahoma. She is developing her expertise in criminology and quantitative methods. She has been a police officer in Oklahoma for the past 17 years and has spent the last 12 years as a criminal investigator. She is currently an Assistant Special Agent in Charge at the Oklahoma State Bureau of Investigation where she oversees the Crime Scene Investigation Unit for the western half of the state. Her primary research interest is in intimate partner homicides. Patrick Green received his B.S. from the University of California, Los Angeles, and, in March 2018, his Ph.D. in biology from Duke University. He will begin a postdoctoral position at Duke in July 2018. Patrick’s dissertation examined how mantis shrimp (Stomatopoda) use the ritualized exchange of high-force strikes to assess and make competitive decisions during territorial contests. More broadly, Patrick is interested in studying assessment in aggressive and other contexts through integrating behavior, biomechanics, and physiology. He is also motivated to connect this work to research on human aggression, using discoveries in each field to inform the other. Marlene Krauch is a psychologist and a licensed cognitive behavioral therapist and is doing her Ph.D., currently in the third year, at Heidelberg University Hospital, Germany. Her research focus is on the behavioral as well as the neurobiological mechanisms that underlie anger and aggressive behavior in patients with Borderline Personality Disorder. She studies adult as well as adolescent patients, as she is interested in developmental aspects of the disorder and aggressive behavioral tendencies. She thinks that deepening the understanding of aggression in Borderline Personality Disorder can contribute to the establishment of appropriate and early therapeutic interventions. Ruschelle Leone received her B.A. from the University of South Florida and is currently a doctoral student in clinical psychology at Georgia State University. The overarching aim of her research program is to inform evidence-based intervention programming to reduce alcohol-related and non-alcohol-related aggression. She is particularly interested in identifying dispositional (e.g., adherence to traditional masculinity) and situational (e.g., peers norms) factors that predict (1) the perpetration of aggression and (2) bystander behavior when witnessing sexual aggression using a range of survey- and laboratory-based methodologies. Eva Mishor received her double B.Sc. from the departments of psychology and biology at the Hebrew University of Jerusalem, and her M.Sc. in molecular cell biology from the Weizmann Institute of Science. She is currently a Ph.D. candidate in the Neurobiology department at the Weizmann Institute, studying communication of aggression via chemical signalling between humans. In her work, she is studying questions such as: What do we emit when we are aggressive? How do these signals affect recipients? Are there natural chemosignals that serve as protectors from conspecific aggression? She is using experimental approaches, measuring behavioral, physiological, and fMRI data. Kristin Perry received her B.A. from the University of California Santa Barbara, her M.A. from San Diego State University, and is currently a doctoral student in clinical psychology at the University of Buffalo. Her research broadly focuses on studying the development and structure of aggressive behavior in early childhood using a developmental psychopathology approach. 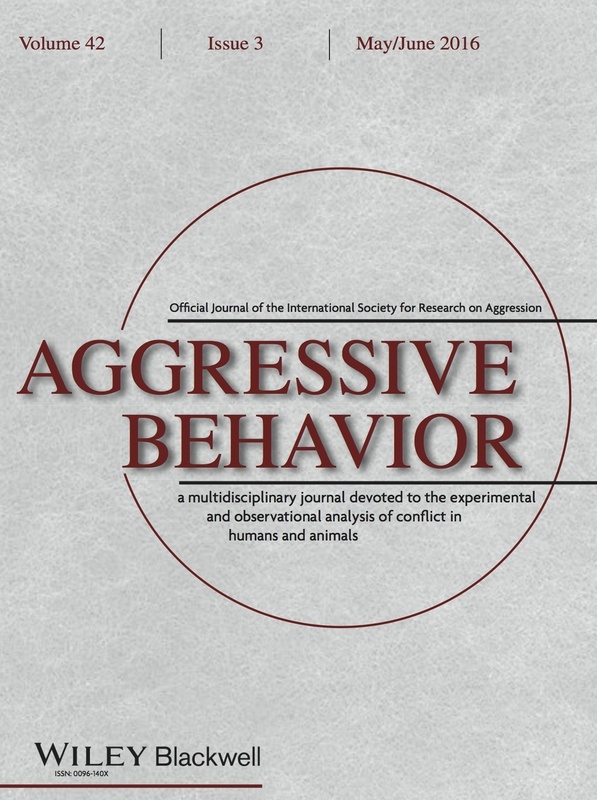 She uses novel methods to examine how different predictors, such as social, biological, and cognitive processes relate to longitudinal trajectories of aggression. In addition, she evaluates the mechanisms that underlie these relations and the moderators that alter these relations. Finally, she takes a gender-balanced approach to her research by examining how these different models and trajectories vary by gender. Danique Smeijers received her bachelor’s and master’s degrees as well as her Ph.D. in forensic psychology from the Radboud University Nijmegen. She is currently working as a postdoc at VU Amsterdam and as a senior researcher at the forensic psychiatric clinics of the Pompestichting. Her research interests include forensic psychiatry in general and aggressive behavior specifically. Most of her work focuses on underlying characteristics of aggression of forensic psychiatric patients with aggression regulation problems, such as interpretation biases. Her work complements our understanding of the development, maintenance, and treatment of severe aggressive behavior. Jean Von Hohendorff is a young researcher and professor in the Psychology Master Program at Meridional Faculty (IMED) in Brazil. He got his undergraduate degree in psychology from The Integrated Faculties of Taquara (FACCAT) in 2009 and his master’s (2012) and Ph.D. degree (2016) in psychology from UFRGS (Federal University of Rio Grande do Sul). During his doctoral training, he attended the University of Alabama School of Social Work as part of a split-site doctoral program. Jean completed a post-doctoral fellowship in 2017. His research addresses the experiences of male youth victims of sexual violence with the primary aims of: a) identifying the sexual violence against children’s dynamics (i.e., occurrence patterns); b) analysis of the Brazilian protection and assistance network for children victims of violence organization; and c) adapting and evaluating a CBT protocol for male youth victims. Nick Wagner received his B.A. and Ph.D. in developmental psychology from the University of North Carolina at Chapel Hill. He is currently an Assistant Research Professor at the University of Maryland, and he will be joining the faculty at Boston University in July 2018. Nick’s research examines the enduring impact of early parent-child relationships, the mechanisms and processes through which psychobiological and environmental factors contribute to the emergence of psychopathology in children, and how self-regulatory processes serve to augment or constrain these associations.